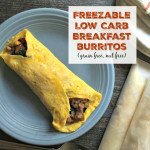 You can make these freezable low carb breakfast burritos in minutes. A delicious low carb breakfast to go. Heat up your oil in a sauté pan with a medium heat. Add your onions and sauté for a few minutes. Add your peppers and sausage and cook until the sausage is cooked. Take off the heat and add your spinach. Stir until the spinach is wilted and let cool. In another small fry pan, add some cooking spray and heat to a medium high. Add 1 well beaten egg to the pan and swirl to coat the whole pan. As the egg starts to set, swirl again to get the egg evenly around the pan. When almost cooked, careful flip the egg over and sprinkle the cheese over the top evenly. Cook for just one minute and slide onto a plate. Add 1/4 of your sausage mixture to the egg "tortilla" and fold. Place on a small cookie sheet. Repeat the egg process with your remaining 3 eggs so you have 3 burritos. Transfer the burritos to a cookie sheet and place into the freezer for 2 hours or until the burritos are frozen. Take them out and wrap individually with wax paper and place in a zip lock bag. To cook, place in the microwave and cook 1-2 minutes.